I feel like you are applying negative connotations to this log. I say this because of the stark use of dark tones throughout the image. The subtle fade from black is very mysterious and eerie. Also the cropping suggests that there is something wrong or off-putting about this particular log. But overall, the dim nature of this photograph conjures up dark feelings and or concern about the log and the environment in which it exists—almost as if there is an underlying narrative. Also the abscense of color and photographic qualities reinforce that negative tone that I think you are trying to portray. Again, the rendering style makes me think that there is something more i should know about or pick up on—mysteriousness. In terms of the mode of transmission, I feel like your physical photograph is representational of your concept and overall "eerie" tone. I felt like your screen based photo exists within a mechanical realm, informing me through a "filter" almost. However, the photo is much more tangible (obviously), but it also gives me a better understanding of the mood and tone you've established. In terms of noise, the one thing that is affecting my ability to communicate with it is the minimal prescence of it. You are showing so little "log" and so much black—i feel like if you could find a middle ground I might better understand/see the log while still maintaining the mysterious/scary tone that has been established. You got it. Exactly! 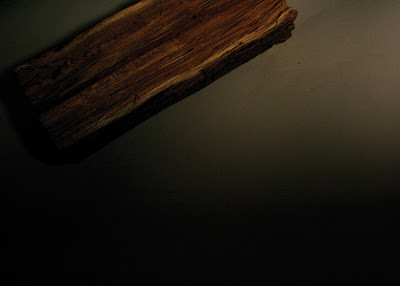 I was trying to go for an eerie, dark, mysterious tone, with the log almost escaping the frame of the image, and being almost completely consumed by darkness. I intentionally made it so you could only see a small portion of the actual object, to reinforce the sense of unknowing mystery.